While browsing through my collection of garden photographs I came across this shot which showcases a well-designed perennial border. This picture was taken in October of 2011 at Chanticleer Garden in Wayne, Pennsylvania. Chanticleer’s tagline is “a pleasure garden” and the grounds really do please the senses. 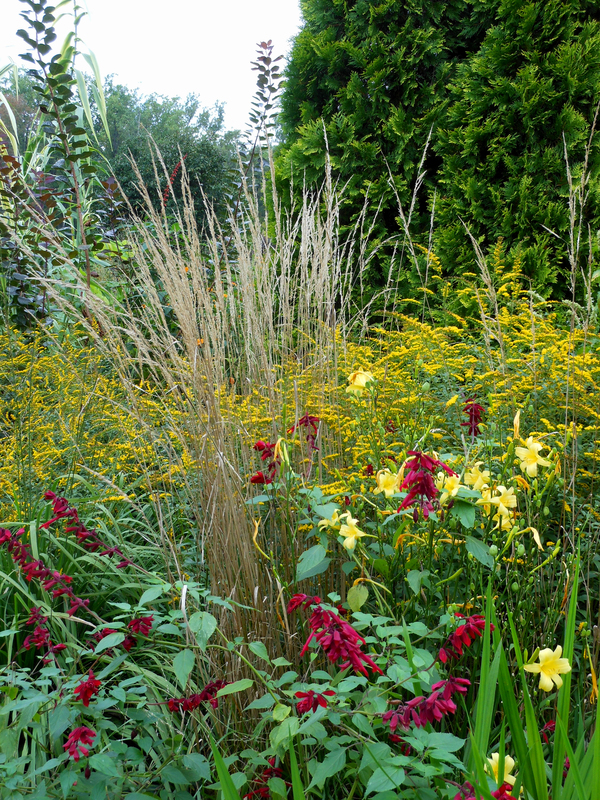 When I look at the plants in this combination, I notice the strong flower structure of the red Salvia, with a gorgeous backdrop of Hemerocallis, fine-textured Calamagrostis (ornamental grass), Cotinus and bright yellow Solidago rugosa ‘Fireworks’ (Goldenrod). The Salvia and Daylilies do not fight with the Goldenrod, which in this arrangement, acts as a neutral filler. The contrast of the Goldenrod with the deep green Arborvitae in the backdrop works particularly well. S. rugosa ‘Fireworks’ reaches approximately 3-4′ tall and blooms from September-October. Solidago prefers full sun and can tolerate moist soil. For a small garden alternative, try Solidago ‘Little Lemon’ a compact variety which grows only 8-14″ tall.